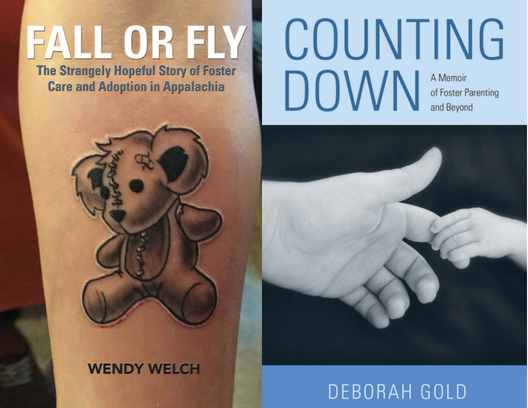 Join authors Deborah Gold and Wendy Welch for a presentation on their books, "Counting Down" and "Fall or Fly," both of which discuss foster care and adoption in the Appalachian regions of Virginia and surrounding states. When Deborah Gold and her husband signed up to foster parent in their rural mountain community, they did not foresee that it would lead to a roller-coaster fifteen years of involvement with a traumatized yet resilient birth family. They fell in love with Michael (a toddler when he came to them), yet they had to reckon with the knowledge that he could leave their lives at any time. In "Counting Down," Gold tells the story of forging a family within a confounding system. We meet social workers, a birth mother with the courage to give her children the childhood she never had herself, and a father parenting from prison. We also encounter members of a remarkable fellowship of Appalachian foster parents—gay, straight, right, left, evangelical, and atheist—united by love, loss, and quality hand-me-downs. Gold’s memoir is one of the few books to deliver a foster parent’s perspective (and, through Michael’s own poetry and essays, that of a former foster child). In it, she shakes up common assumptions and offers a powerfully frank and hopeful look at an experience often portrayed as bleak. Chaos. Frustration. Compassion. Desperation. Hope. These are the five words that author Wendy Welch says best summarize the state of foster care in the coalfields of Appalachia. Her assessment is based on interviews with more than sixty social workers, parents, and children who have gone through “the system.” The riveting stories in "Fall or Fly" tell what foster care is like, from the inside out. In depictions of foster care and adoption, stories tend to cluster at the dark or light ends of the spectrum, rather than telling the day-to-day successes and failures of families working to create themselves. Who raises other people’s children? Why? What’s money got to do with it when the love on offer feels so real? And how does the particular setting of Appalachia — itself so frequently oversimplified or stereotyped — influence the way these questions play out? In "Fall or Fly," Welch invites people bound by a code of silence to open up and to share their experiences. Less inspiration than a call to caring awareness, this pioneering work of storytelling journalism explores how love, compassion, money, and fear intermingle in what can only be described as a marketplace for our nation's greatest asset. Deborah Gold is the pseudonym of a teacher, writer, and former foster parent. Licensed as foster parents for fifteen years, she and her husband eventually gained custody of two siblings. Wendy Welch is a bookseller, ethnographer, and journalist. The author of "The Little Bookstore of Big Stone Gap" and editor of "Public Health in Appalachia," she divides her time between writing up observations of Appalachia, and working to make it a more just and verdant place. Presented in partnership with Arlington Foster Care/Adoption Program.